Now that’s a beautiful Leica, a silver chrome M5. From an aesthetic perspective, I think that the chrome M5 with Summilux is the most elegant M ever made, the “industrial art” design oddly pleasing to my eye, the silver chrome, as opposed to the matte black chrome offering, setting off the camera’s minimalist lines perfectly. Ergonomically, the M5 is superior to the iconic M’s: it fits in the hands perfectly, the viewfinder gives you shutter speed information without taking your eye from the finder, and the overhanging shutter speed dial allows easy one finger adjustments. The M5 has bright line framelines for 35mm, 50mm, 90mm and 135mm with the opening of the entire viewfinder equivalent to the angle of view for a 28mm lens. And, it’s the one M that is foolproof to load- drop in the film, route the leader through the take-up spool as shown on the diagrammed bottom plate, wind once till it catches, close the back and start shooting. 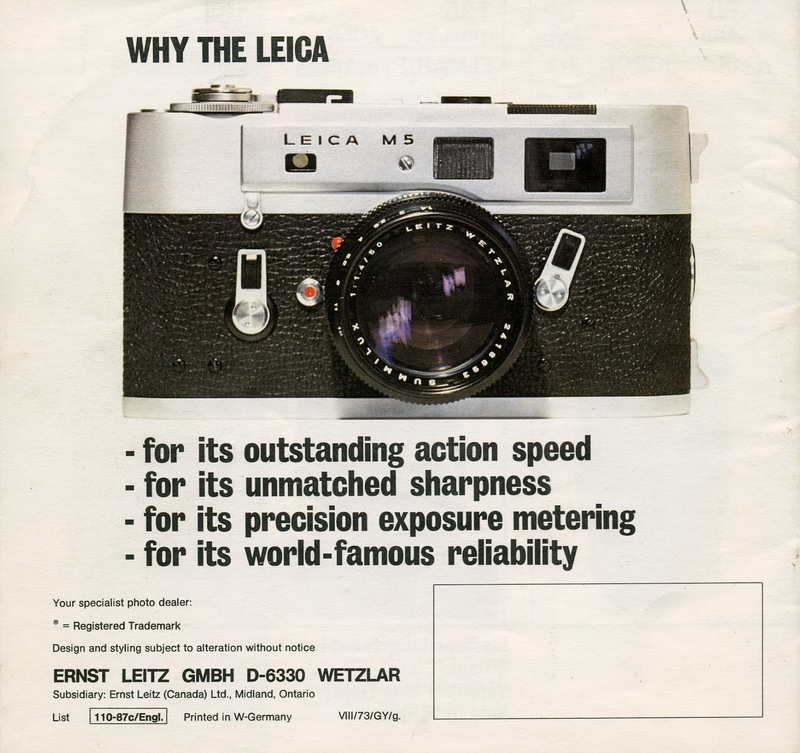 Unlike other Leica film cameras, no incredibally frustrating false starts, missed shots and wasted film, no fiddlng with the camera to figure out what the film is doing; Leitz finally made an easy-loading film camera with the M5. And, it’s got the best meter, a match needle TTL spot meter by Cds cell mounted on a retractable arm in front of the shutter. The match needle operation is quicker and more intuitive than the triangular red diodes used by the TTL metering of the M6 introduced 14 years later. Did it stumble out of the gate when Leitz introduced it in 1971? Yes, but not because it wasn’t a brilliant camera. Its relative sales failure was the unhappy result of a confluence of circumstances that had little to do with the merits of the M5 itself: the professional shift away from rangefinders to SLRS with the introduction of the Nikon F, a much more versatile system camera than a rangefinder; the really stupid marketing decision by Leitz to offer the CL as an affordable enthuisiast alternative to the M5 at a fifth of the price, a move that canniballized what would otherwise be M5 sales; and the relative conservatism of Leitz’s rangefinder users who wouldn’t accept the updated design when measured against the iconic M2/3/4 profile. This entry was posted in Leica M5 and tagged Leica M5 on January 2, 2016 by Leicaphila.